Fixing water damage is no fun, whether it’s because your home is in a flood-prone area, or because you have a leaky pipe or roof or other structural problems. “Water damage” usually refers to water that gets into your home through cracks in foundation, flooding, broken pipes or some other way, and that can cause significant problems (and add up to significant expense) for your house. While you can’t always prevent flooding that happens as a result of natural disasters or simply living in a flood-prone area, we have some tips for how to keep water away from foundation, and how to detect foundation damage signs, in addition to what repairs you might want to consider. How you determine whether or not you have water damage depends on where it is in your home. Foundation water damage, for example, will look different from warped wood floors or ceiling stains. If you are looking at the results of a specific flooding incident, you’re probably checking different things than if you have a slow leak. Wood floor water damage: Since wood absorbs water, kitchen floors are especially susceptible to wood floor water damage. If you have a wood subfloor layer that’s not immediately visible but is underneath carpet or even a “floating” floor layer, you would need to remove the top layers to see what’s happening with the subfloor. Water stains: Staining can happen anywhere, but if you have a roof leak, the most likely stains would be on the ceilings or upper areas of the walls. Also, if you have an upstairs bathroom or washing machine, any leaks from those pipes could cause staining on the ceilings below. However, it’s important to note that water in walls can travel — where the stain appears might not be directly opposite where it’s entering your home. It’s a good indicator that there is a problem, but it’s just the first clue in your investigation. In kitchens and bathrooms, staining on the insides of the cabinets can be a sign that the sink plumbing has a leak. Drywall and foundation water damage: Foundation water damage can be a huge problem, but if you nip it in the bud, you might be able to make the repairs easier. The first foundation damage signs often appear in the other areas mentioned above. If you see warped floors or sagging or stained ceilings, you should be checking your foundation. Drywall could have excess moisture if it is soft and crumbly. It can also appear discolored or swollen (bulging) if there’s water in walls. Sounds of dripping or water movement. Trouble keeping heat moderated. 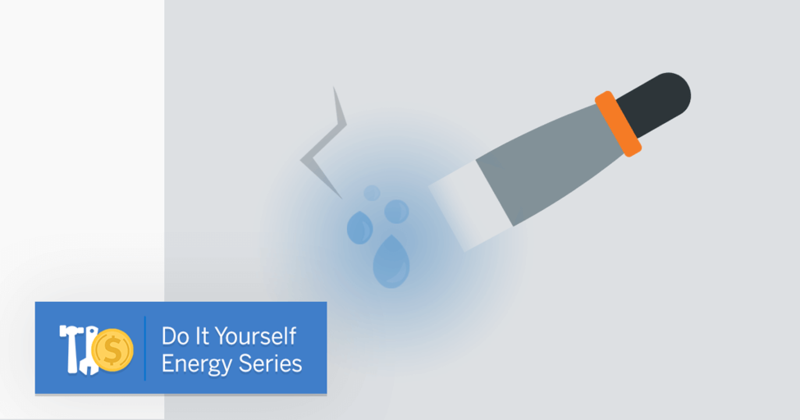 If you have water damage, it could be affecting the humidity level in your home, which could affect how your heat is maintained. Smelling or seeing mold or mildew. Walls that feel cold or damp to the touch, even if you don’t see other signs like stains. 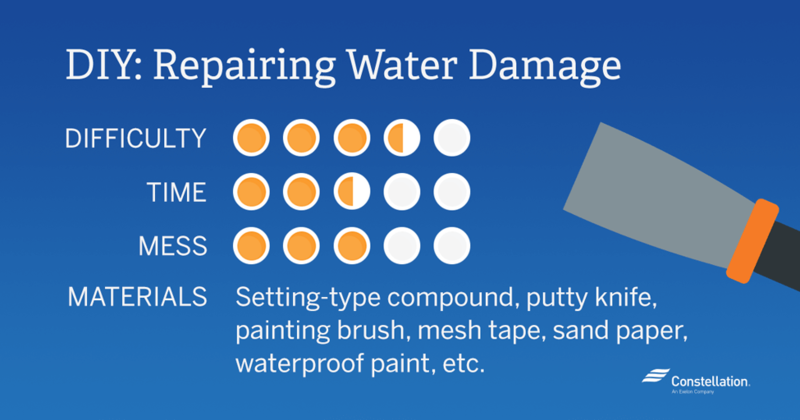 Fixing water damage can seem like a big task, but it’s one that some homeowners can tackle on their own with the correct resources and time. If you’re a do-it-yourselfer, this could be a realistic project, depending on the extent of the repairs. Again, how you approach fixing water damage will depend on whether it’s the result of a single flood event or ongoing leakage from cracks in the foundation or other issues. Select a setting-type joint compound (premixed won’t be as strong). Scrape off the damaged area with a putty knife. If you have an actual hole or a large area of drywall damage, you would cut out that section in order to replace it with fresh material for a flat surface. If you are able to locate the original seam from when the drywall was installed, it would give you a cleaner cut and easier framing for replacement. If the damage was minor, simply prime the area for painting by brushing away any dust or debris so that it looks “fresh” and ready to be painted. If you’re installing a new piece of drywall, cut a piece that is the same thickness and size as your open area. Use mesh tape to secure the joints by applying a first coat of drywall mud. There’s more detail here for how to make sure that your seams are even. Once your seams are dry, you can apply an additional layer of drywall mud in order to level the patch. While it is still wet, you want to skim the patch area to make it as smooth as possible. Once it’s dry, you will sand it to make sure that you’re getting rid of any lasting imperfections. Once you’re comfortable with the smoothness of the edges, go ahead and prime the area for painting just like you would for any other drywall surface. YouTube videos can be a great resource for how to repair water-damaged drywall, along with lots of other DIY projects. For a lot of people, watching someone actually perform each step is very helpful for understanding how to get it done properly. Here are some videos that you could view for help learning how to fix a wall with water damage. Foundation water damage can be a much bigger ordeal and expensive fix than water in walls or other issues, and once you’ve dealt with it, you will likely want to be sure that you know how to keep water away from the foundation in the future. There are some preventive measures you can take to lessen your risk of an ongoing problem with foundation water damage. Plug holes and cracks. Do a visual inspection of the outside of your foundation (and the inside if you have a basement) to see if there are areas where you can see that water could enter. If you find cracks or openings, use hydraulic cement as a patch. Use waterproof paint. Head to your nearest hardware or home solutions retailer and purchase masonry waterproofing paint. Pro tip: Don’t be afraid to paint too thick a layer. The more you can seal openings (no matter how small), the better off you’ll be for sealing cracks in foundation areas. Just be sure to follow safety and application instructions on the product label. Install drainage. This is a more expensive ordeal, but if you have an ongoing problem or if you are purchasing a home that has foundation damage signs, it could be something that you should consider. A chronic leak could be remedied by installing drainage tubing underground (below the basement floor) that is connected to a sump pump or basket. To break the concrete floor, bury the tubing and then repair the floor is a significant cost for materials and requires a lot of labor. You might wish to consult with a drainage specialist or home contractor if you suspect that this is the remedy that would work best. Use landscaping to keep foundation water damage to a minimum. Sometimes, effective landscaping can be a good way to direct water away from your house. Grading: If you can grade your lawn away from the house, it can allow water to flow elsewhere. A French drain can also be effective for directing the flow of water. Mulch placement: If your mulch is up against the foundation, the moisture can wick towards the siding of your house, which could cause rotting and foundation water damage. Give your mulch a six-inch gap between it and the house in order to keep the siding dry. Downspouts: If you have gutters, the downspouts should be directed away from the house, and extended as far as reasonable so that the water is flowing away from the foundation. Grass barriers: If you’re still finding that moisture is finding its way into your home, don your raincoat and boots and head outside on a rainy day. Visually inspect the property to see where you can find pools of water on the lawn. If you can identify areas where rainwater is pooling, try building grass barriers between those areas and the house in order to prevent seepage. You might need to use a combination of methods if you’re fixing water damage, depending on how extensive it is. If you do see foundation damage signs, the first step is to look for the source of the water. A roof leak could cause water in walls to flow all the way down to the foundation, for example. It might take some detective work to find the culprit. When you do figure it out, though, hopefully these tips for how to fix a wall with water damage or dealing with foundation damage can allow you to get things in good shape at minimal expense. If you have suggestions for how to manage water damage, we’d love to hear them. Please share your experiences in the comments below! This post is very informative for those whose houses or house wood works are affected by floods or water damages. In some cases that possible for all that the defects where go away easily by themselves when any person resolves them and in some cases you have to get a professional for the best and reliable work experience. Hi Sagan, we agree — sometimes it’s best to contact a professional to clear up any damages that are too complicated for DIY water damages fixes. Hi John, glad to offer information that helps!